Pixolu is "a prototype implementation of an academic research project on semantic image search." It works, albeit with a few bugs right now. Enter your search term and you will get back a set of about 100 images, culled from flickr, Yahoo and Google. Then, if you want to narrow the results, drag the images best representing your query into a box on the right side, then click "next." Pixolu will then refine the results based on the selections in the box. Click on one of the images and you will see the source, size and URL where it can be found. I searched "guitars" to begin. 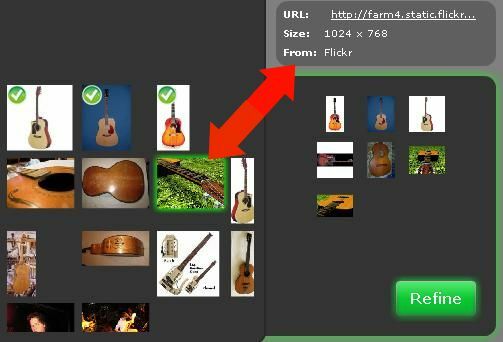 Returned were pictures of electric guitars, acoustic and classical guitars, guitar players, and so on. I wanted to see more acoustics, so I dragged those images to the box and clicked "next." You can see the results below. It appears that they are currently getting more traffic than they anticipated/can handle right now. It is, after all, a project site. So you might experience some difficulties, but according to the site, that should be fixed in the coming days. Overall, it's fun and a pretty good way to find some images without sifting through page after page of results.